I’ve rambled on before about how often we have Pancakes in this house – Its definitely not a once a year occasion. I’m slightly more conservative than the kids – Its hard to get me to deviate from a lemon/sugar topping/filling. The girls are much more adventurous than me (probably because they think that if they don’t like something, there’ll be an endless stream of fresh pancakes to replace it with). We were sent some Strawberry and Pepper Jam and some Chocolate Sugar from the East India Company especially to help celebrate Pancake Day. The chocolate sugar went down a real treat – It smells strong when you open the cork (which comes with a gorgeous wax seal – I have GOT to get my own wax seal!) When you sprinkle it over a pancake, it isn’t that chocolatey though. This isn’t a bad thing – the girls didn’t want too strong a taste but loved the crunch of the sugar. Apologies for the picture, typical isn’t it that your pancake doesn’t turn out well if its going to be photographed! Would you just look at those podgy fingers itching to dig into that pancake?! I have to admit, none of us were particularly keen on spreading Jam on a pancake but we can most heartily recommend the Strawberry and Pepper Jam lathered onto a crumpet – so much for us being adventurous!?! Ingredients – I got this from my mum but I really couldn’t tell you where she got it from. Its probably just a recipe that ‘everybody’ knows! Whisk the eggs and add a little at a time – It will more than likely be very gooey and lumpy at this stage. Do not panic. Add the milk, whisking constantly. Your mixture should now be a lot more liquidy and smooth. You might need to whisk again a few times as the mixture will settle. Heat the oil in the pan until a tiny drop of mixture dropped in, sizzles immediately. 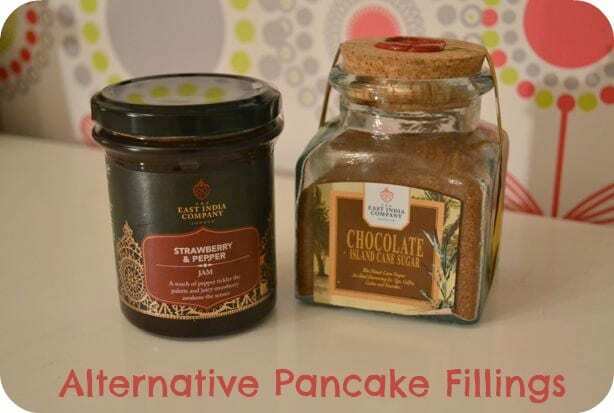 Cook for a couple of minutes on either side and eat immediately – I have still never got to grips with freezing pancakes – Mainly because we tend to eat them all straightaway! Disclosure: I was sent the jam and chocolate sugar to review by East India Company. They are running a promotion on pancake day but I was given the choice of what to write about. The Strawberry and Pepper Jam retails at £6.96 per jar. Chocolate Sugar retails at £10 per jar and has a date until 2018! 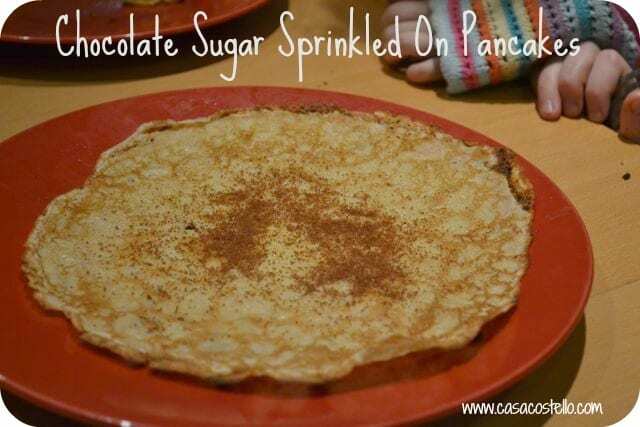 I like to keep it simple with pancakes too but that chocolate sugar does look very appealing! The strawberry and pepper jam sounds like a wonderful combination, I’d like to try that on some scones!